My daughter loves to share her best books with me. From time to time she will walk up to me and say, “Papá, you have to read this.” One of my favorites was The Girl Who Circumnavigated Fairyland in a Ship of Her Own Making – just a fantastic tale and the start of a really imaginative series. 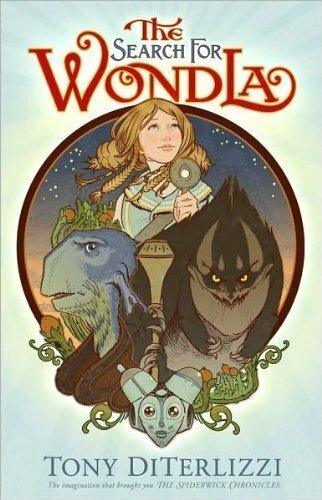 Another was the WondLa series, from an author I really admire: Tony DiTerlizzi. Tony is revered by the D&D community for his work on Planescape. Back when TSR had several full-time artists on staff, they would form teams working on specific worlds. The worlds would take on the character of these artists, forming around them. You can see it with Dark Sun, shaping around the amazing art of Brom and Baxa. In Planescape you see it with DiTerlizzi’s work. His imaginative style really fits a setting where anything is possible. You can find a compilation of his fantasy work in his recent book, Realms: The Roleplaying Art of Tony DiTerlizzi. After leaving TSR he continued to illustrate, including for Star Wars (I picked this up last Christmas for my son), but he also writes some great novels for young readers. Non-gamers probably know him best for The Spiderwick Chronicles, but I love the WondLa series the most. It is really a perfect book for a young child, with the right blend of adventure, assurance, real emotion, substantive issues, good ethics, and imaginative adventure. I especially appreciate that the series is an evolution for the character, which helps to give the young reader a healthy perspective on their own evolution as the main character grows up and faces hard choices. I was maybe halfway through the first book, The Search for WondLa, when my Numenera book arrived. The Numenera book is actually fairly light on rules. The core bits occupy a fairly small space, with the rest being setting and beasts and the like. I do dig the default setting, but it struck me that The Search for WondLa was a great story for introducing Numenera. Often a sci-fi setting is so big and the ideas so new, that it can be hard to understand what the characters should know and not know, and therefore how to translate that wonder (or acceptance) to the players. “Here’s this fantastic thing… that you take for granted.” I’m going to have to give away a lot of the WondLa story in my upcoming posts, but for now I’ll avoid that and give you the chance to read the awesome novel. Don’t worry, this blog won’t fade away. You can come back. But, I will say that Search for WondLa is great because the character is suddenly thrust into an unexpected world. The way it happens is perfect for introducing players to a fantastic sci-fi setting. Everything new is really new, for both the players and their characters. I like that, because we were learning a new RPG. Discover the rules, discover the world, discover the story. That was the key that drew me to using WondLa as a campaign, but it also had to do with this being a great story. It feels right as an RPG experience. It also fits well for a game like Numenera, which is fairly rules-light and story-centric. I wasn’t looking for a long campaign, so I set a goal of no more than five sessions. I was able to pull off the novel trilogy’s plot in four sessions of 4-5 hours each, which was an impressive feat for me. I tend to run never-ending campaigns. I’ll share what I did to condense so much into so few gaming sessions and provide you with what you would need to run this as a short Numenera campaign. One of the interesting results was that the campaign felt far bigger than it was, in part because the players would drive the narrative and I would bend the story around their actions. Next we will describe how the campaign began, with an illusion mirroring the novel’s. 2014 interview on the finale to WondLa, Star Wars, and Dungeons & Dragons! As luck would have it, Christopher Helton just wrote up this ‘Talking Art And Determination With Tony DiTerlizzi’ interview for EN World today! This entry was posted on December 5, 2015 by Alphastream and tagged Numenera, Sci-Fi, Setting.